What do you do when your nieces invite you to go on a trip with them? You pack your bags fast...before they have a chance to change their minds! That is what I did, recently, when my niece, Haley, called. Her idea was to round up another niece, Ayla, and head to New Orleans. I love my nieces and I love New Orleans. This was a no-brainer! 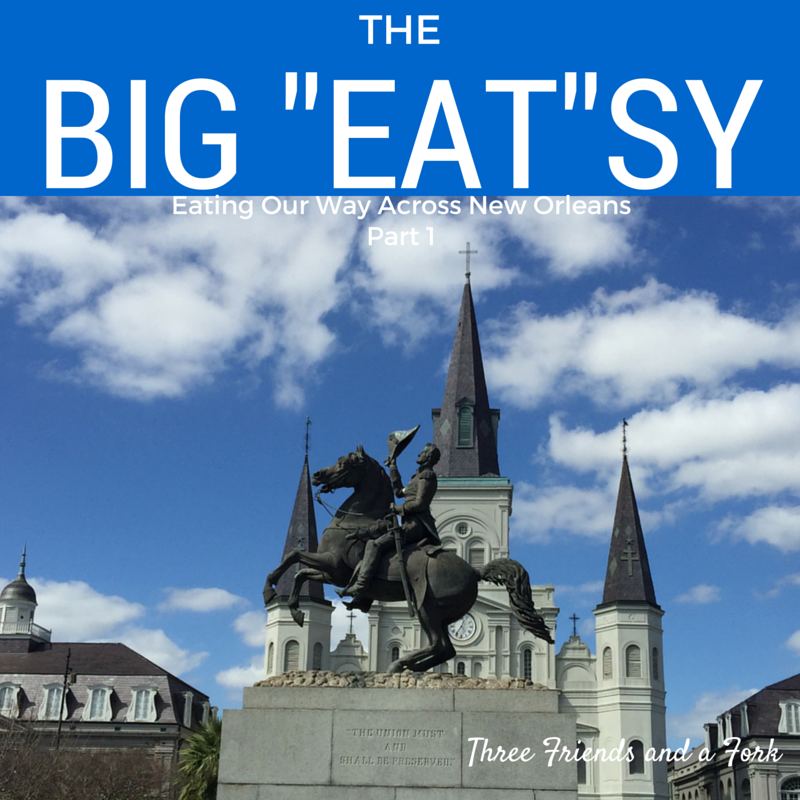 We traveled through the night so that we could make the most of our two full days in the Big Easy, or Big "Eat"-sy, as it should be known. Really, is there anywhere in the world with more delicious food than Nola? I don't think so! We spent two days checking out the sights, eating delicious food and walking our legs off between the two. Our phones let us know that we walked nearly 23,000 steps in one day! Day 1 began where everyone begins Day 1...Cafe Du Monde for chicory-laced coffee and those powdery New Orleans fried pastries known as beignets. We shared two orders of beignets and sipped our coffees while we watched the crowds. I am pretty sure a dusting of powdered sugar and injection of chicory is a prerequisite to anything else you might choose to do in New Orleans. Properly fortified, we were ready to take on the town. We checked out the shops around Jackson Square and then ventured into the St. Louis Cathedral, the oldest Roman Catholic cathedral in continuous use in the U.S. We walked in just as the Stations of the Cross service was beginning, so we stayed for the service, which was very beautiful and reverent. Just walking into the church from the busy square lowered our blood pressures. It was so calm and peaceful inside the beautiful cathedral. We took in the views of the mighty Mississippi River. We found a shop full of all kinds of soft drinks and tried a ginger beer. It was pretty refreshing after walking in the heat and humidity typical of New Orleans. Seriously, we were burning up in the middle of February. Horses and carriages line the streets waiting for their next customers. After a hot morning of exploring the square, we caught a trolley for a late lunch at Commander's Palace. We were really excited about eating in this classic New Orleans establishment. Let me just say, we were not disappointed! To begin with, it was beautiful. We started our lunch with 25 cent cocktails. I am not kidding! Ayla and I had melon martinis and Haley had a Cosmopolitan. We decided we liked the Cosmo the best. Before we got to the restaurant, I sent a tweet to Chef Tory McPhail, the executive chef of Commander's Palace, telling him we had reservations. While we were sipping our cocktails, we received a reply to my tweet. To say that we were excited would be an understatement! We showed the tweet to our server and he said he would take us to the kitchen as soon as we finished our meal. For all of you Commander's Palace newbies, you don't have to wait for a tweet from the executive chef to visit the kitchen. It is open to anyone interested in visiting. The tweet did make us feel special, though. While we were anticipating our visit to the kitchen, we also had to get down to business and decide what we wanted to order. It was a hard choice, but Commander's Palace made one selection easy for me. I am almost always drawn to soup if it is on the menu and Commander's Palace had three, turtle, gumbo and mirliton tomato. They all sounded wonderful. Luckily, there was an option to order all three in smaller portions. I quickly chose the trio. We had a hard time saying which was best, because they were all so good. Ayla finally said she liked the gumbo best, Haley picked the turtle and I chose the mirliton tomato. I also chose the oyster crostini from the appetizer menu as my entree. I love oysters and these were delicious. The crispy fried oysters were paired with melted leeks, artichokes and baby spinach over grilled ciabatta. It was sitting in a puddle of yummy Herbsaint-smoked Gouda Mornay sauce dotted with spiced chili oil. It was so good! Ayla ordered a beautiful salad of petite greens tossed with local strawberries, sweet fennel, peppered chèvre, spiced pecans, and banana bread croutons drizzled with an ederflower-champagne vinaigrette. Look how gorgeous it was! She also ordered a confit chicken cassoulet with crispy confit chicken leg and white bean cassoulet with house-made andouille, tasso, grilled French mirepoix and satsuma gremolata. It was hearty and rich. Haley took my suggestion and ordered the laquered quail. I had enjoyed this dish so much when Chef Tory had come to the Bright Star to cook a couple of years ago. It was amazing then and it did not disappoint this time either. The quail came with fire roasted chili and cochon de lait boudin over brown butter spaghetti squash with Tabasco pepper jelly and espresso quail jus. I do not know how Chef Tory lacquers a quail, but it leaves the skin similar to the crunchy top of creme brulée. It is beyond delicious. The spaghetti squash was delectable as well. In fact, I kept stealing it from Haley's plate and got a couple of dirty looks! Speaking of creme brulée, just look at the Commander's Palace creme brulée. It was almost too beautiful to eat...almost! It was in a large, shallow bowl, so there was a greater than average brulée to creme ratio. We loved it! While we were eating, we were entertained by watching this guy make drinks for another table. I have never seen such detail involved in making cocktails. He spent quite a long time and many steps in getting these just right. Here is the finished drink, called Goodnight Lally, a coffee infused cocktail with Remy Martin VSOP Cognac, Liquor 43, a touch of sugar and hot coffee topped with house-made vanilla whipped cream. We didn't taste them, but they looked beautiful and they were made with such care. After we finished our dinner, our server escorted us down to the kitchen to say hello to the gang. Then we strolled through the green courtyard and back out to the street. Right across from Commander's Palace is Lafayette Cemetery #1. It was closing just as we arrived, but one of the guides let us step inside the gates for a minute to look at the ornate mausoleums. The cemeteries in New Orleans remind me of little neighborhoods with tiny houses for the dearly departed. It was a busy morning and our day was far from over. Next time we will tell you about the rest of day one. For now, we will give Cafe Du Monde and Commander's Palace 3 Crazy Good Yums Up. Until next time...Laissez les bons temps rouler!